I’ve tried so many edtech tools that I thought this year I’d pick some of my favorites to share. I’ll gift a new tool complete with tips, tricks, and tutorials each day in December. You can scroll through the presentation or use the advent calendar image to skip around for tools to explore. Check back to see what will be unwrapped next! Original Post written by Veronica Zehnder. What an amazing year we have had as the 2016-2017 AP Bio Rockstars! We began the year so uncertain but by the second semester, we felt like we had conquered the class! However, the second semester came with even more tasks that we were challenged to push through. I thought that the first semester was crazy but the second semester was way more intense (and fun of course). I want to stress how many projects we did this semester! I didn’t even realize how much we had accomplished until I started reflecting on the year. Here is a quick (very long) list of all the projects and challenges we mastered this semester.Most of these have more blog posts that you can check out on our individual blogs. From Season 8 to Season 11, the AP Bio Rockstars have had an incredible semester! While I am one of the lucky few that will be able to see some of my Bio sisters next year, everyone in the class will have some incredible memories and knowledge to hold on to. I have loved this class, especially this semester, because of all the incredible projects we were able to do! Today’s youth are passionate about making an impact and positively changing their world and technological tools can allow students of any age to do just that. As an educator, my job is to find resources, develop learning experiences and provide opportunities that allow my students to identify a problem and become part of the solution. Encouraging students to explore their interests and passions can lead to incredibly meaningful learning. My students ask themselves questions that direct their inquiry, and I use resources that help them investigate the world, share their voice and make a difference. #DoNow and Quest present relevant, timely topics — from a variety of content areas — that spark discussion and help make connections between what’s being learned in the classroom and students’ real-world experiences. In my class, we begin each year by investigating the global water crisis. Students who have grown up in California are accustomed to living in drought conditions. But while they may know that water is precious, they can still turn on the tap in their house and drink freely. We explore the issue from multiple perspectives, including the environment, climate change, health, the economy and social justice. The Quest Collection on Water is a fabulous resource. While much of the research highlights the global crisis regarding lack of access to clean water, there are positive solutions being designed. You’re bound to get a visceral response when students watch Cleaning Poop From Drinking Water. Encourage them to dream up solutions of their own! Young learners are often told that they can make a difference. I say, go one step further and show students how they can make a difference. Connect with local organizations where students can volunteer or, better yet, take your class on a field trip. If cost is an issue, apply for local grants that provide funds to get students out of the classroom. Target Grants offer up to $700 for a trip! Each year I take students to work with Save the Bay. 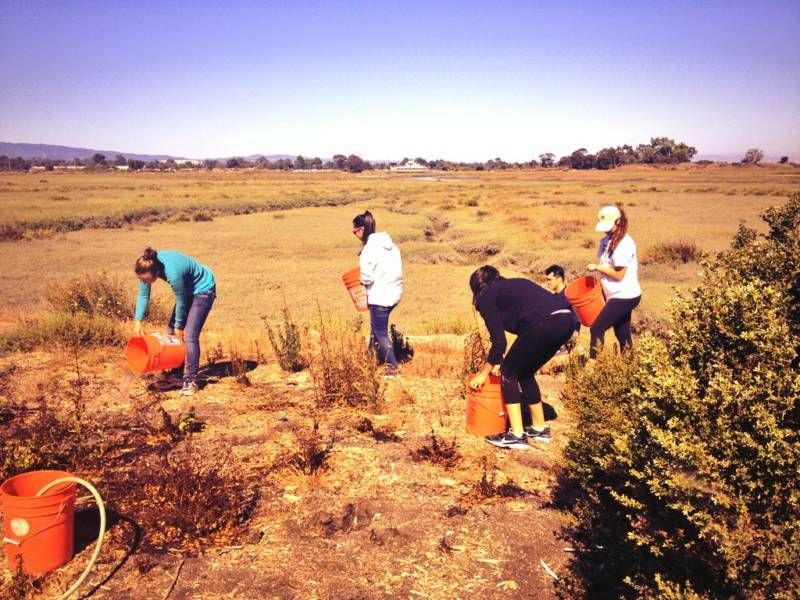 We collect data in restored and unrestored sites along the San Francisco Bay Trail and students get their hands dirty planting native plants. We also work with LiMPETS, collecting data at a Pacific Ocean marine reserve and studying populations and the impacts of climate change. Take advantage of students’ mobile devices by using apps like iNaturalist to encourage exploration of the physical world. Last spring, my students participated in a BioBlitz competition between Northern and Southern California to see which area could identify the most species. Using their phones, they explored their local area and posted their findings to iNaturalist. The app allows you to create class groups, helps you find a BioBlitz near you, and allows you to create your own competition! Go online with HHMI’s Biointeractive Resources on Gorongosa Park. Students learn about ecology and conservation biology, plus they can virtually join in the effort by identifying and cataloging animals caught on camera in the park. My students were excited to compare their list of animals caught in action, which sparked a vibrant conversation about animal behavior. Check out CitizenScience.org and follow #CitizenScience to find more resources. The new organization is looking for members to help direct its future, and you can become an inaugural member of the Citizen Science Association. How can I share with others? Providing my students with an authentic audience has been empowering for them. Connecting classroom content to the “real world” makes a lasting impact and deepens their learning experience. My students engage with other youth through #DoNow via its online platform or through Twitter. Teens love using social media, and I enjoy showing them how these tools can be used to inspire conversations that educate and encourage the development of empathy. Encourage students to post ideas on a class website or help students create digital portfolio sites. Letting students know that their ideas will be shared outside the classroom often encourages them to raise the quality of their work to a different level. Creating for one teacher is not as motivating as creating for a larger community. Depending on the subject, students can write blog posts, design presentations and create videos to be showcased on a site. OpenIDEO is always presenting new challenges and students can be involved in researching, sharing ideas, providing and receiving feedback, and iterating their design ideas. Winning solutions receive $25,000 to make their idea a reality! The annual Breakthrough Junior Challenge hosted by Khan Academy asks students to create a five-minute movie explaining a scientific concept. The winner receives $250,000 in a college scholarship! My favorite part of this project is that all submissions are peer reviewed by the applicants. Students are required to review five other videos and receive feedback from youth around the world. Next Vista Learning is a great resource for video competitions. There are always new contests and topics to inspire student creation. The site also offers media-making tips and tutorials. Take advantage of the many tools available to create learning experiences that will empower your students and provide inspiration for them to impact their world now and in the future! I believe that teens are our future! I have been working with teens since I was a teen myself. I began coaching when I was 16 and started on my journey to becoming a teacher when I was 19. I stepped into my own classroom 3 months after I graduated from college. I was only 3 years older than my oldest student. 20 years have flown by, but the students who walk into my classroom remain the same age. They are somewhere between 13 and 19 years old, but I can definitely say that the teens of today are not the teens of 20 years ago. Today’s teenagers have the power of technology literally at their fingertips! I remember when my parents scrimped and saved to purchase the Encyclopedia Britannica from the door to door salesman. They bought the entire set of the latest edition book by book. By the time the collection was complete, the information in its tissue thin pages was already long outdated. Time had passed since the entries were researched, written, edited, organized, published, and shipped to our house. With access to technology, students have the opportunity to make an impact no matter what their age! Last school year, I focused on providing opportunities for my students to share their voice in civil discourse and as citizen scientists. The experiences included data collection field trips with LiMPETs and Save the Bay, a biodiversity scavenger hunt using iNaturalist, and incorporating KQED #DoNow into classroom discussions and as blog posts on their digital portfolio websites. At the end of the year, I asked my students to reflect on the journey. What had they found valuable throughout the year? I found a common thread as I read their posts. They found the experience of actively taking part in real world studies and discussions invaluable. 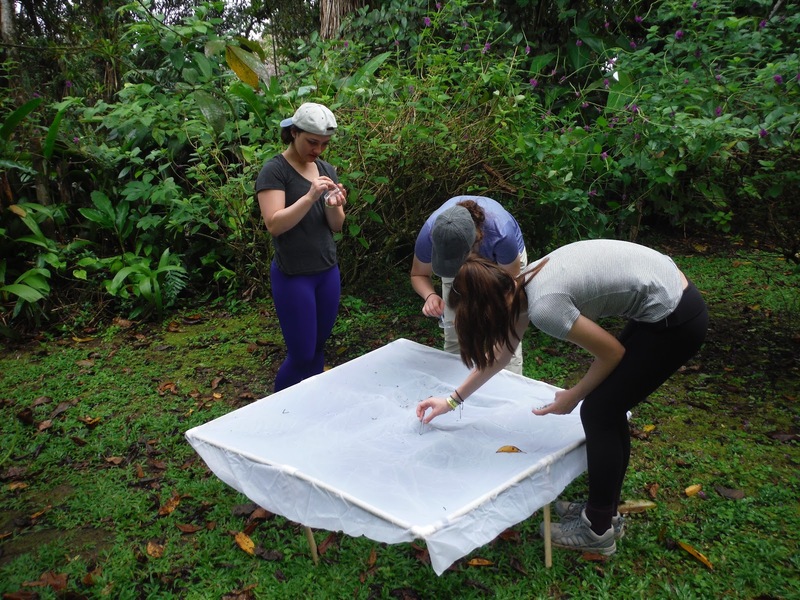 You can’t get more real than working on site with professional scientists to collect data for ongoing research. Or how about using #DoNow to spark discussion about the Flint water crisis or the Zika virus? Teens are passionate about their world and discovering how they fit into their community. They want to make a difference now. All I needed to do was find resources that would spark their interest. As I prepare for a new school year, I know I will continue to incorporate#DoNow and QUEST videos as discussion starters and ways to help students develop their own driving questions to investigate. I will also provide opportunities for my students to make connections outside our classroom, both in person and by leveraging digital media and communication. It’s all about curating the resources, sharing them with students, and then letting them lead the way! I am a lifelong learner and have been a professional educator for over 20 years. Along my educational journey, I have seen many ideas come and go, but I remain focused on teaching students the skills they need to become successful members of society and to develop their own love of learning. Reflect on the process of learning. Develop 21st century skills – empathy, communication, critical thinking, creativity. Build an ideal resource for a resume and college applications. Here are three questions to ask yourself as you embark on this new path. Taking the first step can be the hardest so encourage yourself, and your students, to start small. I suggest beginning with a class portfolio to share the learning in your classroom once every week or two. This will help students see the progress of their learning and encourage conversations while building your own publishing skills. You can have individual students or small groups decide what to add to the portfolio and design posts. Then, once you and your students are ready, move on to having each student create their own digital portfolio. 2. Where should the portfolios be hosted? Determine which tool is best suited to support your goals. If your school uses Google Apps for Education, you can develop incredible portfolios using Google Drive, Google Sites and Blogger. Some benefits to Google Apps for Education are the privacy settings. You can decide to keep the portfolios private, invite a specific audience to view them, or connect them directly with the worldwide audience. The ability for students to collaborate through Google is unrivaled. I use Blogger to host our class blog and students are guest bloggers who share their experiences in the class. I include the links to each of my student’s portfolios on our class blog so they’re all connected in one place. You can check out our AP Bio Rockstars site. When I first decided to dive into digital portfolios, I debated between allowing students to choose their platform or requiring a specific platform. In the end, I chose to use WordPress as our student platform because of it’s reputation as a professional platform. Since making this choice, other website/blog creators have come on the scene such asWeebly and Wix. There are also digital portfolio apps like Three Ring,PathBrite, and Seesaw. I work with high school juniors and seniors and I want their portfolios to be presented to a wide, authentic audience so they use WordPress to develop a complete website. I have become familiar with WordPress and have stayed with one platform to help coordinate my own workflow. Having students use the same platform means they can support one another as they learn to navigate and populate their site. I do not have to be the only expert in site design! I also direct the overall organization of the sites so that no matter what theme they choose, each site has a similar layout so that they are easy for everyone to navigate. 3. How to manage the portfolios? I am sure you have thought about the amount of work and organization it could take to manage all of these portfolios. The following strategies have worked for me to make the workflow a bit easier. Google Forms to the rescue! Each student fills out a Submission Form that collects their name, title of the assignment, and link to the actual post. The spreadsheet allows me keep track of submissions and click on each link to assess their work. Share the spreadsheet of links with the class allows for peer review. Students work at a higher level when they are sharing with peers and they have the opportunity to reflect on their own work and learn from their peers. Use Formal Commenters that students must acquire. These are individuals outside our school population who commit to reviewing each assignment and posting a comment to the site. Mine is the incredible Erin Kahn, whose support and creativity have sustained me on the journey. Find a colleague at your school or in your district. Connect with an educator through Twitter to collaborate with and keep you on track. Find inspiring blog posts to read to keep you fueled along the way. Taking the risk to develop digital portfolios with my students has been a transformative experience. Each post is an opportunity to demonstrate mastery and showcase creativity. My students know they are communicating with an authentic audience. They work to develop their voice as they share their ideas. The best part is that student work is no longer submitted only to me for my assessment and their work does not disappear by being stuffed in a backpack or thrown in the recycle bin. Each student has the road map of their learning journey to take with them as they continue into college and beyond. Designing and deploying robust, interactive lessons that engage students with real-world problems that demand application of content to produce innovative solutions is both exciting and demanding. One of my critical challenges has been providing feedback to students about their performance. I always feel pressured for time to consistently connect with each of my students. I have learned that the 4Cs: communication, collaboration, critical thinking, and creativity can form a great frame for thinking about ways to engage students in a peer review process that teaches and reinforces these vital skills. Our learners will not be prepared for the 21st Century by relying on rote memory of content. They’ve got Google for that! To develop the 4Cs, I must provide experiences that enhance deeper learning. If learning happens best when students experience a lesson, then engaging students in the process of providing peer feedback is part of the learning! Extra bonus = each student receives timely feedback from multiple perspectives, their peers and me. Since then, I have refocused the process of developing the skills students need to include providing meaningful feedback to their peers. During the process, students also develop their own voice as they reflect on their learning. CREATE a culture of providing feedback. Every year, I start by explaining the importance of feedback. There are endless resources like the Seven Keys to Effective Feedback, that support the benefits and describe how to provide meaningful feedback. You will have to commit time to the process. When students are comfortable with their peers, they are more likely to appropriately give and receive feedback that matters. We play games together and get to know one another. We focus on the goal of helping each other develop and improve. I’ve learned that frequency is essential to creating a culture that values feedback. For example, we begin reflecting daily on short assignments like homework or a class activity. Think, Pair, Share can be a quick way to begin a face-to-face discussion. Students share their work with one another, giving informal, verbal feedback. The more often you practice the process, the more comfortable and confident the students become and their feedback skills improve. We build up to writing reflections on major papers, lab reports, and projects. In addition, giving students opportunities to incorporate the feedback and revise their work keeps the focus more on the process of learning instead of just the grade. Learn the language of clear COMMUNICATION. When I was in graduate school, I was introduced to the RISE Model developed by Emily Wray. (@EmilyWray). This invaluable resource has been my number one tool ever since. RISE Model by Emily Wray is licensed under a Creative Commons Attribution-NonCommercial-ShareAlike 4.0 International License. Emily’s infographic outlines the language of feedback. Students will frequently say “great job” or “nice work” to their peers, but what does that mean? Providing examples of specific vocabulary to use opens up a whole new level of feedback. Students move through an organized process as they design responses that are meaningful and describe specifically what was “great” and what needs improvement. Emily has also designed an infographic for self-reflection! Meaningful feedback starts with understanding the content and expectations of an assignment. Last fall, my students competed in the Khan Academy Breakthrough Junior Challenge. Students created a video tutorial about a topic in science and were required to review other student entries from around the world. Many were challenged to review videos about unfamiliar topics. Most were unable to give specific, clear feedback if they did not understand the content of the tutorial. I listened as they naturally compared their videos with those they watched. Exercising critical thinking skills, students identified how their own tutorials may not have been as clearly explained as they thought. They also discussed the reviews they received to determine if the other students had provided meaningful feedback. I could clearly see how this feedback process provided opportunities to critically think, analyze, and learn together. This experience also led me to design rubrics students can use to assess peer feedback and self-reflection skills. Now students are developing metacognition during the process as well. Again, the goal is to enhance the process because the process IS the learning! Focus on feedback that relies on COLLABORATION. Rich feedback happens when students can collaborate with peers. Asking and responding to questions develops a collaborative culture that mirrors the 21st-century workplace. This takes time, but every minute spent encouraging students to critique their work and their peers’ work is time spent learning! Use a variety of tools to get students collaborating and communicating about their work. Digital tools allow time for processing of information and forming of clear, concise thoughts. Time and time again I have been particularly impressed by the comments shared by my more introverted students. Quieter students have an opportunity to share their voice without the pressure of speaking in front of a crowd. Google Apps like Docs, Slides, and Draw allow for comments to be embedded and threaded in a document. Reflect and share on a discussion board. An LMS, like Schoology, may have this function or try Collaborize Classroom. VoiceThread is another go-to tool that allows for group discussion using text, audio, and video. If you haven’t seen it yet, you’ve got to check it out! Engage students in real-world discussions using KQED #DoNow. The weekly topics are perfect conversation starters that help students practice the 4Cs. Giving my students time to practice providing feedback has transformed the learning environment in my classroom. Students are more comfortable sharing their work with peers. Knowing that I am not the only one to see what they create has also improved the quality of the work produced. Students are developing the 4Cs every day and it is these skills that will help them succeed. How do you develop student voice in your classroom? What types of opportunities do you provide that allow students to practice the 4Cs? Bats, Macroinvertebrates, and Rapids are Amazing! After a delicious breakfast, we began our morning by checking on the traps we had set for the bat droppings. There were many samples to collect. Each sample was carefully analyzed to separate the seeds from the fruit from the other stuff. Then, using a microscope and a field guide, we identified as many seeds as we could. Everyone was amazed to see how different each type of seed looked. The data collected helps to provide evidence to support that bats do indeed drop seeds in open areas and the majority of these seeds come from the surrounding garden plants. Bats are extremely important to the forest ecosystem. Pollinating and planting means that the forest can continue to produce and thrive. We LOVE bats! Then the really exciting parts of the day began. 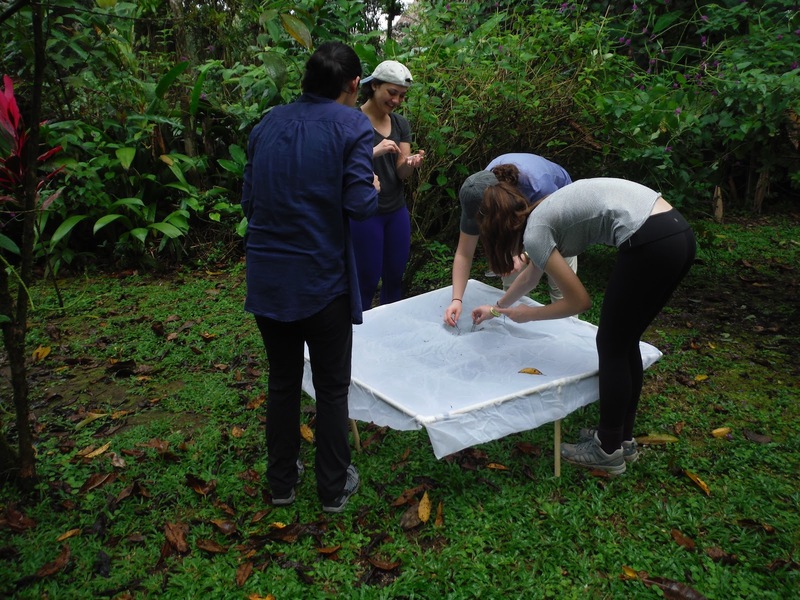 We headed down to the Sarapiqui River to test the water quality and catch macroinvertebrates. Our research determined that the water quality is fair in this area. Everything here is so focused on sustainability and protecting the environment. It is inspiring. After some time to relax and a delicious lunch, we loaded the van to head to another exciting adventure…white water rafting. It had been raining all day which helped to feed the river. Class 2 and 3 rapids greeted us and it was a blast. All smiles and excitement as we floated along and navigated the rapids. There were so many great pictures from today that we had to share with a short video. Enjoy! Mary Francis' AP Bio Blog! AP Bio with Caroline Divney! Engage and Motivate by Rebecca Girard is licensed under a Creative Commons Attribution-NonCommercial-ShareAlike 4.0 International License. Blogs and Posts about my AP Bio journey! Kelsey's experiments, investigations, and conclusions from AP Biology. A Portfolio of my work from AP Biology 2018-19 and more!